The brand new co-op Zelda adventure for 3DS, The Legend of Zelda: Tri Force Heroes, finally has a release date! Polish up your boomerang and tell your friends to call in sick. October 23 is the day the tri-force gets a little more cooperative. 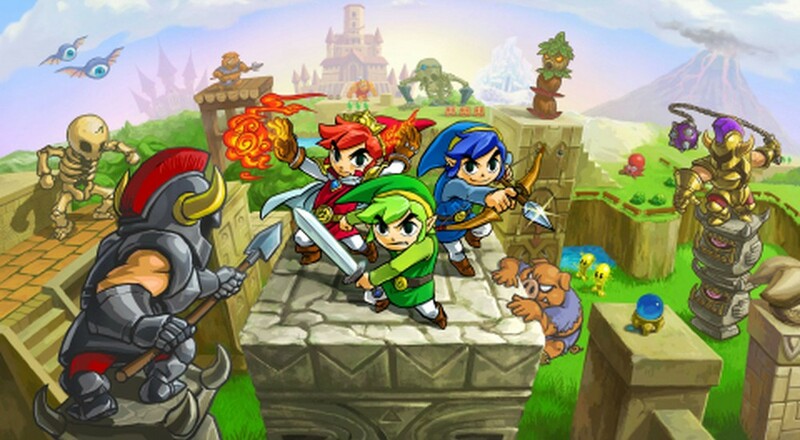 The Legend of Zelda: Tri Force Heroes is all about outfits. Each player picks a Link donned with a unique outfit that brings with it a unique boost or ability. One version might shoot arrows, another function as a medic, that sort of thing. Up to three local or online co-op players then adventure through dungeons helping each other solve puzzles and survive the perils of sliding spike things and whatever those spinning fire traps are called. Did you hate those in A Link to the Past? Because I sure did. An interesting new mechanic is the totem system that allows three Links to stack on top of each other to reach higher ground. This also means The Legend of Zelda: Tri Force Heroes can be played solo by "renting" paper doll versions of Link, which doesn't sound like a desperate attempt to pretend like you're popular. Really, it doesn't. The video above shows off a good 15 minutes of gameplay, plenty to get you pumped for the October 23 release. Page created in 0.6554 seconds.